The largest laboratory for Global Ecology, founded in 1984, was supported by a number of key people. Space Biospheres Ventures (SBV), the owner of Biosphere 2 site and Biosphere 2 facilities, was a 50-50 partnership between Decisions Team Ltd. (DTL) and Decisions Investment Corporation (DIC) created in 1984. SBV located the site, and developed, designed, created, managed and researched the full operation of the $ 200,000,000 Biosphere 2 facility from 1984 to April 1, 1994. 1. John Allen: Executive Chairman 1984-1986 and Director and Vice President Biosphere 2 Research, Development, and Engineering 1986-1994 who was a Director of DTL and invented Biosphere 2, and consulted the formation of the enterprise and co-founded Biospheric Design. 2. Margret Augustine: President and Chief Executive Officer of Space Biospheres Ventures who was a 20% owner of DTL plus 1% owner of DIC through Biospheric Design, the architecture company and prime contracting corporation for Biosphere 2. Margret, an architect, was also CEO for Biospheric Design, which was the prime contractor to build Biosphere 2. 3. Edward Bass: Chairman, 80% owner of DIC, and was part of the management team as Financial Director of Space Biospheres Ventures (SBV). 4. Marie Harding: Chief Financial Officer, 20% owner of DTL, Vice President and 1% owner of DIC through Biospheric Design and the Institute of Ecotechnics. 5. Mark Nelson: Director of Earth and Space Applications, Chairman of the Institute of Ecotechnics, (UK), and 20 % owner of DTL. Institute of Ecotechnics (IE) owned 5% of DIC and had a 1% royalty agreement with SBV 1984-94 for its intellectual capital contribution and as science consultant. 6. Kathelin Gray: Director and 20% owner of DTL and trained the Biospherians in coordinating the many different roles they had to play with her Theater of All Possibilities techniques. From April 1 to June 1994, John Allen, Margret Augustine, Marie Harding, Edward Bass, Mark Nelson, Kathelin Hoffman, the the Board of Space Biospheres Ventures (SBV), negotiated an agreement “satisfactory to all;” which dissolved the SBV partnership and transformed the joint venture into a corporation with Ed Bass the majority owner and the Institute of Ecotechnics, DTL, and SARBID as minority equity owners. Allen and the team that created Biosphere 2 then formed two new companies, Biospheres, LLC, to design and build the next generation of artificial biospheres, and EcoFrontiers LLC, to carry out projects in rainforest, savannah, sustainable agriculture, and urban biomes related to Earth biosphere problems. These two companies then merged in 1999 as Global Ecotechnics Corporation, which carries on several biospheric research and development programs. The Institute of Ecotechnics also continues its biospheric work, holding an annual international conference at Global Ecotechnic’s Les Marronniers project in Southern France. From April 1,1994 to December 31, 1995, Edward Bass operated Biosphere 2 through his appointed President, Steve Bannon and Scientific Committee, led by Wallace Broecker and Michael Crow of Columbia University. One of the purposes of Mr. Bass negotiating to gain majority control was to limit the scope of the Biosphere 2 Project by turning it over to reductionist scientists. This new reductionist oriented management team soon had a crisis with Mission Two and had to shut down Biosphere 2 down on September 6, 1994. It is important to realize that no further total system science has emerged from Biosphere 2 since that date. January 1st, 1996, With the shutdown following from DI’s new policy, Mr Bass turned the project over to Columbia University for five years to operate as a world class educational center with smaller scale ecosystems studies with emphasis on CO2 levels. 2003 – Columbia University, after being given a new ten year lease, 2000 – 2010, to continue with Biosphere 2, decided to withdraw from its agreement with Mr. Bass in 2003. 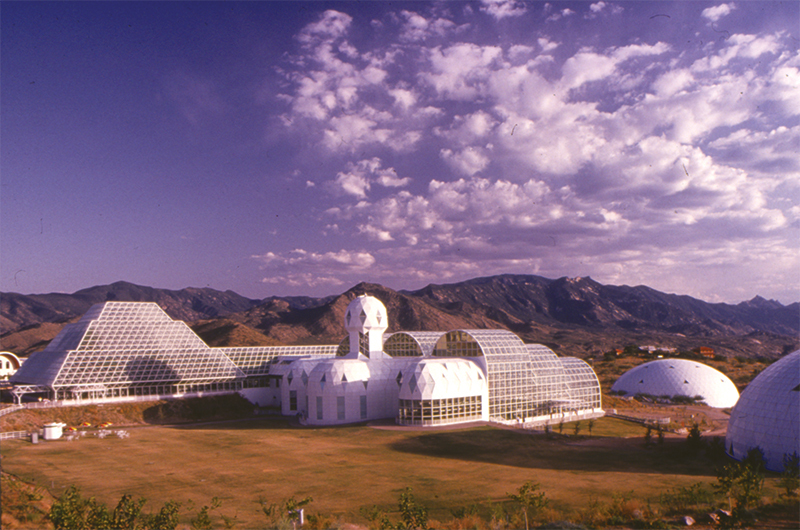 Conceiver and co-founder of the Biosphere 2 project – the world’s largest laboratory for global ecology. Ms. Alling has actively engaged in marine, environmental and closed system research and development projects. Co-Founder, President, CEO and Project Architect, Biospheric Design, Inc.
Director of Systems Engineering and chief engineer for the Biosphere 2 project of Space Biospheres Ventures. Founding director of the Institute of Ecotechnics. Exec. VP and shareholder, Global Ecotechnics Corporation. Chief Operations Officer and Director, Biosphere Foundation and its Division the Planetary Coral Reef Foundation (PCRF), Belize.